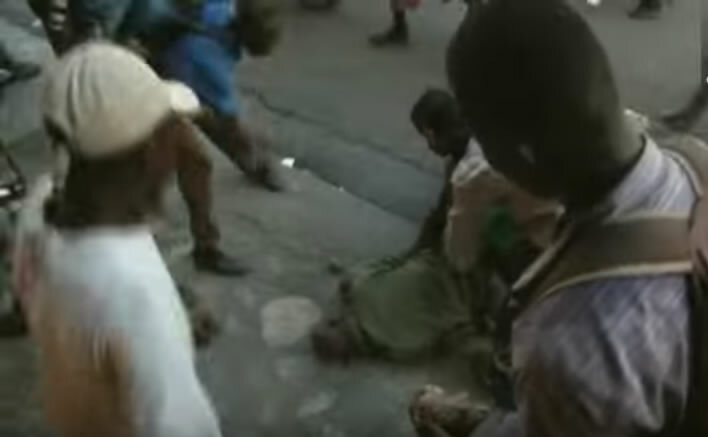 Here is a picture where an Ex Haitian soldier became victim during an anti-government demonstrators. Martelly was due to leave his office within February 7th, but the squabbled politicians of the country failed to complete the recent election process with a runoff and elect a successor for the outgoing President Martelly. Some of the weak opposition leaders are demanding the comeback of former President Aristide as an interim leader as a replacement. We might remember that Aristide disbanded the Haitian army in 1995 in an attempt to end the military dominance over the Haitian politicians, because it had records of toppling governments since the Haitian independence two centuries earlier. Aristide was twice ousted in coups; lastly he was toppled by a US-backed military coup back in 2004. The politicians are also discussing several other options like appointing a Supreme Court judge or a new prime minister to run an interim government. Last year, Martelly energized the former army men by taking steps to revive the armed forces and he has repeatedly pledged that it would be revived to protect the border, coastlines and the country's few remaining forests. However, as per the news report, the ex-military people were rallying in support of both the outgoing President Michel Martelly and his hand-picked candidate Jovenel Moïse for the next presidential race. While driving through the capital in convoys, some of them were waving weapons and firing into the air. The victim was carrying a small card bearing the image of ruling-party candidate Jovenel Moise.